So easy to pull together with only a handful of ingredients. Brown ground beef and onions in a large skillet on medium-high heat until cooked through. Layer mixture in a 9x13 pan. Add the beans on top followed by the enchilada sauce, Ellsworth Valley Cheddar Cheese, and Cheese Curd crumbles. Bake for 20 minutes uncovered. 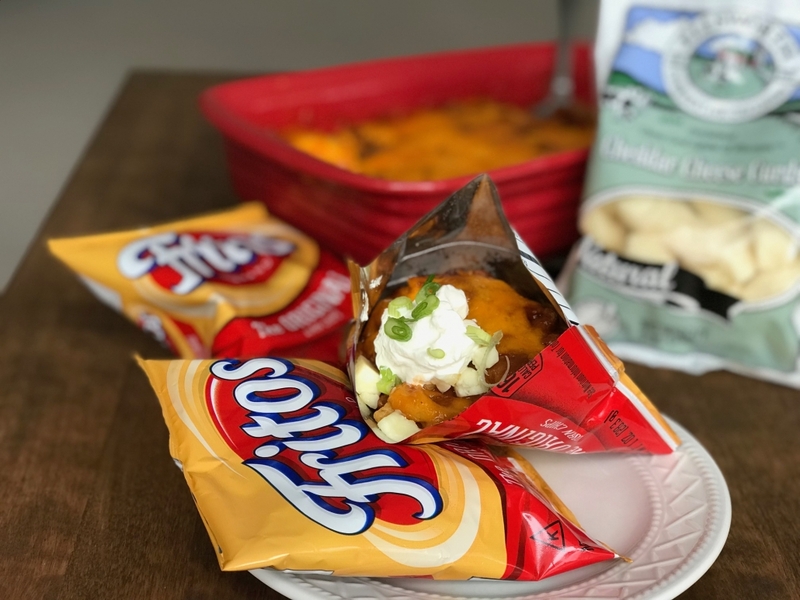 Let cool while you prepare the Frito bags. Cut open mini bags of Fritos on their side and then spoon the meat mixture on top of the Fritos. Top with green onions, additional Cheese Curd crumbles, and sour cream.